eeep, this post is going up a little late because I am distracted by the face that my littlest sister is birthday her twin baby girls right now! I can't wait to meet those tiny cuties. Send all of your easy-delivery vibes her way, please! 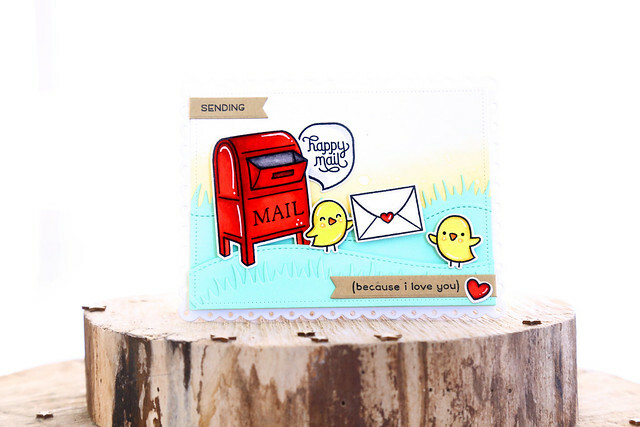 If twins wasn't exciting enough (it is for me, probably not for you) Lawn Fawn is showing off their new Valentine release. I paired the new Love Letters images with the big mailbox from You've Got Mail. I love the pops of bright red on this card! The little birdies are just so sweet. Check out the LF blog this morning for so much more inspiration - click!